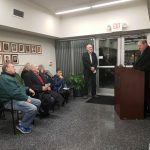 The new Maplewood Veterans Memorial Plaza was unveiled in front of Maplewood City Hall on November 16th with a ribbon cutting ceremony. 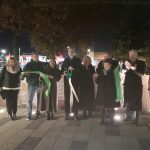 The plaza features a 4-foot high by 20-foot long granite memorial wall that commemorates the names of those from Maplewood that gave their lives in military service. The memorial wall also includes 6 bronze medallions; 1 each from each of the military service branches and MIA/POW. 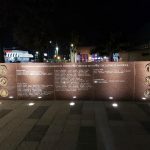 The 20 foot by 40-foot plaza contains light- and dark-gray concrete pavers that can be inscribed to honor other service members and two solid limestone benches. The United States flag and City of Maplewood flag is mounted on a 35-foot high flagpole centered in the plaza and on the entry to City Hall. Two 30 foot high flag poles are located in the lawn east of the plaza and contain a POW/MIA flag and State of Missouri flag. New lighting has been provided and the landscaping and water feature have been upgraded.